This is a collection of backing tracks. 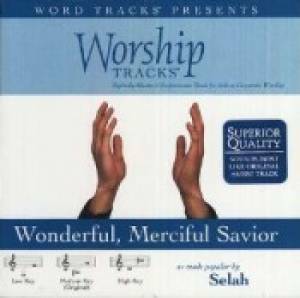 Wonderful Merciful Savior - Backing Tracks was published by Word Entertainment in June 2006 and is our 34053rd best seller. The ISBN for Wonderful Merciful Savior - Backing Tracks is 0080688663520. Be the first to review Wonderful Merciful Savior - Backing Tracks! Got a question? No problem! Just click here to ask us about Wonderful Merciful Savior - Backing Tracks. On this CD, what songs are the backing tracks for? A:The backing tracks are all variations of backing tracks for the single song, 'Wonderful, Merciful Saviour' by Selah, and are as follows: 1. Wonderful, Merciful Savior (Demonstration Version) 2. Wonderful, Merciful Savior (Low Key Version With Background Vocals) 3. Wonderful, Merciful Savior (Medium Key Version With Background Vocals) 4.Wonderful, Merciful Savior (High Key Version With Background Vocals) 5. Wonderful, Merciful Savior (Low Key Version Without Background Vocals) 6. Wonderful, Merciful Savior (Medium Key Version Without Background Vocals) 7. Wonderful, Merciful Savior (High Key Version Without Background Vocals) Thank you for using the Q&A Forum.